ICJA volunteer exchange worldwide contributes to practical peace work and supports societal and political involvement through international exchange and intercultural education. ICJA is a non-profit organization which sends German volunteers abroad for one year to over 40 countries and, in turn, organizes one year stays for international volunteers in Germany. 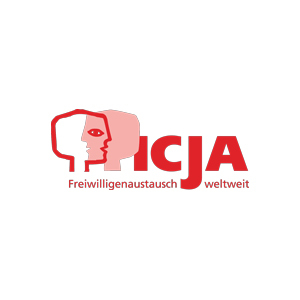 ICJA organizes Workcamps in Germany and is active in the field of Global Education f.e. in schools. Our aim is to facilitate respectful and open interactions between people from different cultures and religious backgrounds. We understand our exchange programmes as an educational opportunity. Central to our concept are contact, cooperation and a fruitful exchange between volunteers coming from the northern and the southern hemisphere. ICJA volunteer exchange worldwide continuously develops his programme and initiates national and international peace work, North-South compensation, the European idea, intercultural education and the promotion of social participation. Argentinien, Bolivien, Brasilien, Costa Rica, Dänemark, Dominikanische Republik, Ecuador, Finnland, Frankreich, Ghana, Großbritannien, Honduras, Indien, Indonesien, Island, Israel, Japan, Kenia, Kolumbien, Marokko, Mexiko, Mozambique, Neuseeland, Nicaragua, Nigeria, Philippinen, Schweiz, Spanien, Südafrika, Südkorea, Taiwan, Tansania, Togo, Uganda, USA, Vietnam, Russland.